Lakers News And Rumors Recap: Help On The Way? 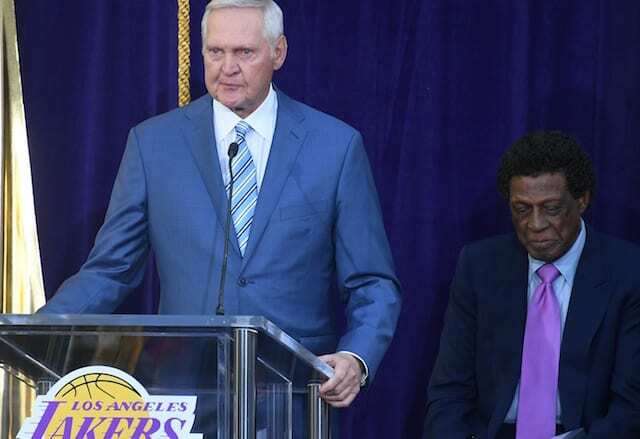 As the Los Angeles Lakers continue to scuttle through the season, future personnel moves have once again risen to the forefront of discussions. The latest round of rumors are centered around two players many Laker fans have been clamoring for quite some time — Cleveland’s Kyrie Irving and Minnesota’s Kevin Love — and a relatively new name, Phoenix Suns guard Eric Bledsoe. According to ESPN’s Chad Ford, Irving has privately been telling those around him that he wants out of Cleveland. While the Lakers likely don’t have enough pieces to currently entice the Cavaliers to trade their All-Star point guard, Irving’s contract runs through the 2014-2015 season and how Dan Gilbert will handle the matter is something to keep an eye on. As for Love, who many have essentially considered a lock to join the Lakers once his contract allows, ESPN’s Chris Broussard reports one general manager told him Love joining the Lakers is a “100 percent certainty.” Love will be a free agent in 2015. There is the possibility the Lakers address the point guard position prior to any potential trade talks with the Cavaliers. Broussard also reports the Lakers may make a substantial offer to Bledsoe, who is set to become a restricted free agent following the 2013-2014 season. On the injury front, Steve Blake, Jordan Farmar and Steve Nash all returned to practice on Thursday. Each have been ruled out for Friday’s game, with Nash potentially returning on Tuesday. Pau Gasol was held out of practice due to a groin injury but is listed as probable for Friday. NBA Rumors: Kyrie Irving Privately Trying To Get Out Of Cleveland? Lakers Rumors: Lakers Willing To Overpay To Sign Eric Bledsoe?